Getting the most out of your camera - Ghumakkar - Inspiring travel experiences. There is no time to think and plan when such incidents take place. Auto exposure cameras work best in such cases. The way to freeze an action is ‘choosing fast shutter’. इससे पहले कि मैं किस्सा-ए-फोटोग्राफी शुरु करूं, अगर अनुमति-ए-आपकी हो तो पहले एक किस्सा सुनाना चाहूंगा। सुना है कि एक छात्र फोटोग्राफी सीखने के लिये मुंबई के एक प्रख्यात फोटोग्राफर के पास पहुंचा। पांच दिन तक कैमरे के सभी अंग-प्रत्यंगों का परिचय देने के बाद, गुरु ने अपने शिष्य से कहा कि अपने कैमरे में एक फिल्म डालो और निकल पड़ो मुंबई की फोटोग्राफी के लिये ! जो कुछ भी अच्छा लगे, उसकी फोटो खींच लाओ ! गुरुजी ने पुनः एक फिल्म लोड कराई और कहा कि कल जाकर गेटवे ऑफ इंडिया के सारे के सारे फोटो इसी एंगिल के खींच कर लाओ! बेचारा शिष्य पुनः गया और सुबह से शाम तक उसी एंगिल से भिन्न-भिन्न प्रकाश में फोटो खींचता रहा। शाम को पुनः प्रिंट फैलाये गये और गुरुजी ने जब शिष्य से पूछा, “कौन सा फोटो पसन्द आया है?” तो शिष्य ने बता दिया कि मुझे तो सूर्यास्त के समय का यह चित्र सबसे अधिक भा रहा है! गुरुजी ने उसे कहा, “जाओ, तुम्हारी शिक्षा पूर्ण हुई!” तुम्हें photographic subject, various angles और various types of lighting का ज्ञान हो गया है। फोटोग्राफी यहीं से शुरु होती है, अब जीवन भर फोटोग्राफी करते रहो और सीखते रहो! यदि इस कहानी की इश्टाइल में मैं भी अपनी तुच्छ बुद्धि से कुछ बताने का प्रयास करूं तो सबसे पहले मुझे कैमरे के मूलभूत अंगों की जानकारी देनी चाहिये। फोटोग्राफी 50% विज्ञान है और 50 प्रतिशत ललित कला ! ललित कला की ओर बढ़ सकें, इसके लिये थोड़ा – बहुत विज्ञान जानना आवश्यक हो जाता है, भले ही हम चाहें या न चाहें ! चलिये, प्रयास करता हूं कि बिना आपको अधिक बोर किये कुछ जानकारी दे सकूं ! सभी महत्वपूर्ण जानकारी द्विभाषिक रूप में दे रहा हूं ताकि हर किसी को सुभीता रहे ! इतना तो हम सभी जानते ही हैं कि हमारा कैमरा ’अच्छी फोटो’ ले सके, इसके लिये उसे एक निश्चित मात्रा में प्रकाश की आवश्यकता होती है। अच्छी फोटो वह मानी जायेगी, जिसे देख कर हमें संतुष्टि हो और मन को यह लगे कि फोटो खींचने का उद्देश्य पूरा हो गया! In order to capture an image successfully, a certain amount of light is required by the camera. A picture, if serves its purpose well, is good. There are four methods available to us for controlling the amount of light reaching the film / sensor of the camera. However, while we can get exactly same exposure by employing any of these four methods, the photo that we would get by playing with these controls would be different in each case. As shown in above table, we can employ any one or more methods to control the required exposure. If we can increase/decrease the intensity of light, we also have the options of controlling the shutter duration / aperture opening or the senstivity of the film / sensor. Please look at the two middle columns of above table and think of a situation where you are getting correctly exposed picture at 1/125 sec. and f=4 aperture. Now, if you want an aperture of 11 instead of 4, there are three ways to do it. 1) Change the shutter speed from 1/125 to 1/15. But this would increase the risk of camera / subject movement. 2) Increase the intensity of light so that it is 6400 watt instead of 800 watt. 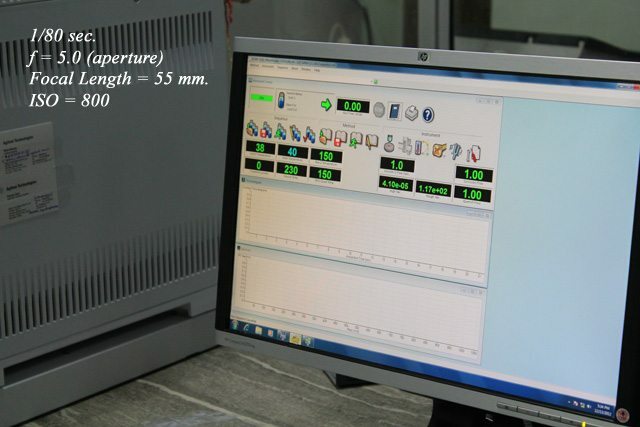 3) The third and last method would be to increase the ISO speed from 200 to 1600 ISO. In the days when film cameras were highly popular, we had to decide ISO speed of the film at the time of buying a film. If most of the shooting was to be done in low light, we wanted faster film and vice versa. 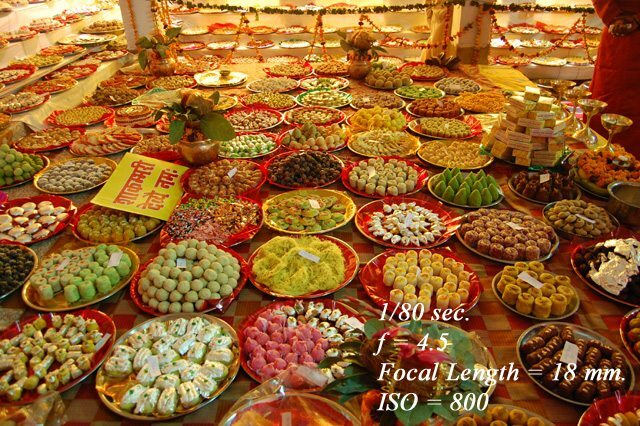 In Indian market, films slower than 100 ASA or faster than 400 ASA were used by specialist photographers only and were generally not available in the market. I can’t help remembering the days when I used to shop for such special purpose films from Madan Ji at Chandni Chowk, Delhi or similar other showrooms nearby. I had to practically run after this little devil to keep her well in frame. It should be evident to everyone that exposure is doubled / halved as we move up / down from one row to the other in any of the four columns. If you are a bit confused while looking at the aperture values, please rest assured that these values also have the relationship of half / double exposure as soon as we go down or up from one row to another. 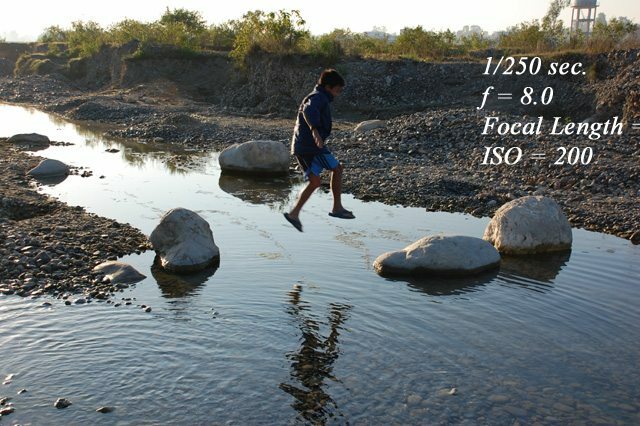 In fact, we arrive at these figures by dividing focal length of the lens with the effective diameter of the lens. If our lens has got 100 mm. 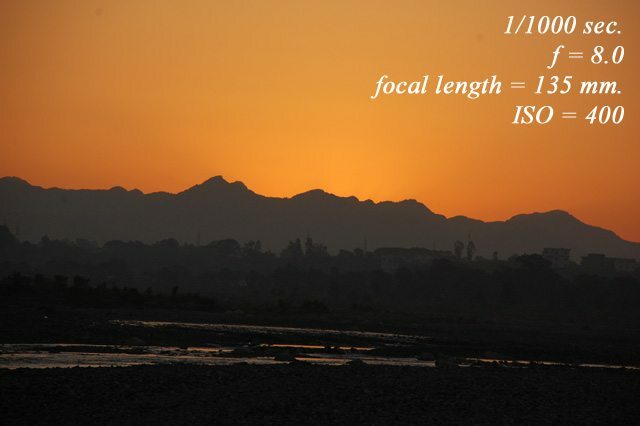 focal length and the dia. Of the lens aperture is 50 mm., we get aperture value of 2 which also means that at 2 aperture, the lens is allowing only half the amount of available light. M=Manual, A=Aperture priority, S=Shutter Priority & P=Programmed auto. There are two kinds of cameras available – automatic and manual exposure type. An automatic exposure camera may set the shutter speed or the aperture or both automatically with the help of an electronic exposure meter built into the camera. If the light is not enough, the camera may even switch on the flash fitted into the camera. 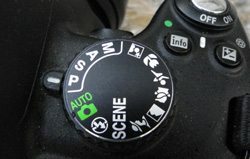 The Manual Exposure Camera, on the other hand, merely suggests that the presently selected settings will give ‘correct exposure’ or not and if not, whether the picture would be under-exposed or over-exposed. 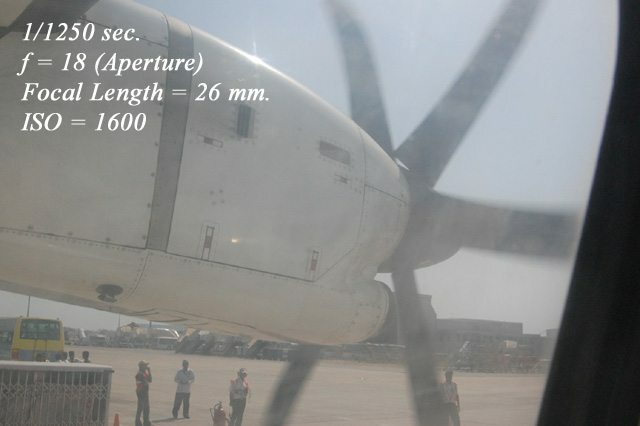 However, it can’t proceed to change the aperture / shutter speed values on its own. It is for you to decide what settings would prevail. Sometimes, the photographers deliberately ignore the settings being suggested by the camera in order to achieve some special effect through over/under exposure. Modern cameras offer both the modes – AUTO as well as MANUAL. Not only this, AUTO MODE offers a large number of options – Aperture Priority, Shutter Priority, Shift Program, Full Auto etc. In AUTO mode, several scenes are also being offered – Landscape, Portrait, Sports etc. If you have a camera that offers full MANUAL mode enabling you to set aperture and/or shutter speed manually, besides offering AUTO MODE, you are definitely blessed with a good camera. Even the splashing water is frozen with the help of high shutter speed. एपरचर और शटर की सैटिंग बदलने से सिर्फ प्रकाश की मात्रा यानि एक्सपोज़र पर ही फर्क पड़ता हो, ऐसा नहीं है। उदाहरण के लिये, शटर खोले जाने की अवधि कम करके (यानि fast shutter speed e.g. 1/1000 sec. या इससे भी कम समय) हम चलती फिरती वस्तुओं को भी रुका हुआ दिखा सकते हैं। आम तौर पर पैदल चल रहे व्यक्तियों को रुका हुआ दिखाने के लिये 1/500 सैकेंड का समय पर्याप्त है, वहीं दूसरी ओर तेजी से भागी चली जा रही कार को रुका हुआ दिखाने के लिये 1/4000 सैकेंड का समय पर्याप्त हो सकता है। फोटो खींचने का समय केवल 1/50,000 सैकेंड किया जा सके तो संभवतः बंदूक से निकली हुई गोली भी हवा में रुकी हुई नज़र आयेगी! Timing of pressing the shutter is important. Fast shutter virtually stops the movement of blades. Blades are moving at same speed but the shutter speed is slower here. 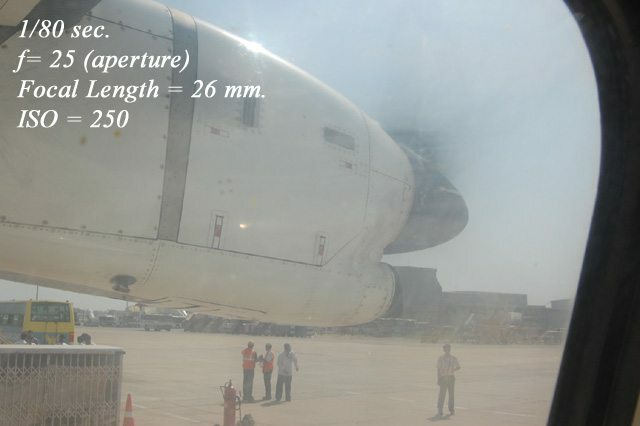 It is not that shutter and aperture can only be used for controlling the amount of light reaching the film / sensor. For example, we can play with different shutter speeds for creative purposes as well. By opening shutter for extremely short duration, we can freeze movement of virtually any subject. A sports person taking a high jump may look as if hanging mid-air just above the pole by taking his photograph at 1/1000 second or even faster shutter speed. A lot of scientific experiments to understand kinetics have been possible by freezing movement of a bullet passing through a water-filled baloon by giving an extremely short exposures of 1/50,000 second duration. As of this day, no camera allows shutter speed faster than 1/12,000 second but flash can fire for much shorter duration. इतना अवश्य है कि दिन में सूर्य के प्रकाश में इतना लंबा एक्सपोज़र देने के लिये हमें प्रकाश को बहुत कम करना पड़ेगा। ऐसा हम एपरचर को न्यूनतम करके ( जैसे 32) और ISO senstivity को भी न्यूनतम करके कर सकते हैं। इससे भी गुज़ारा न हो तो अपने कैमरे की लेंस पर ND filter (Neutral Density Filter) लगा सकते हैं। ND Filter लगाने का अर्थ है अपने कैमरे को काला चश्मा पहना देना। आई बात समझ मां? On the other extreme, we can use long exposures (more than 1 second and upto several minutes) to get interesting photographic results. 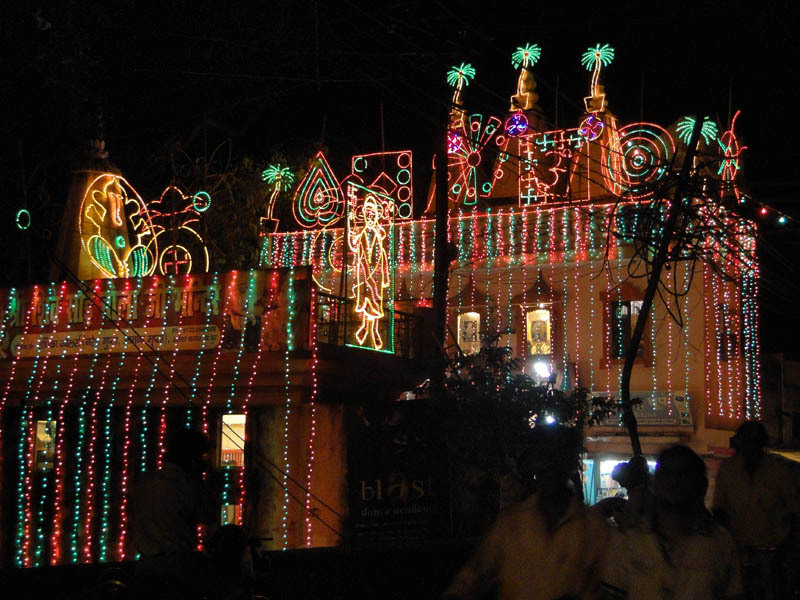 Artificially lighted streets and buildings on special occasions like Diwali, light streaks caused by headlights and red coloured tail lamps of moving automobiles, moonlit scenes, colourful fountains are examples of this type of photography. However, it is compulsory to provide good support (e.g. a tripod) to your camera to avoid camera movement during exposure. As DL pointed out recently in one of his comments, the rule of thumb is “not to use shutter slower than the focal length of your camera lens. If the camera lens is set at 50 mm. 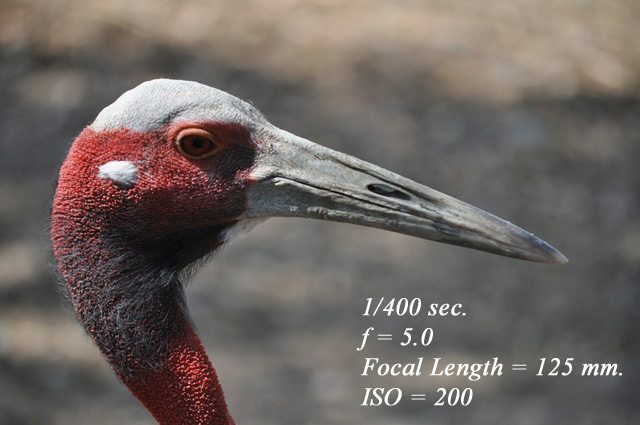 focal length, it is difficult to get sharp pictures if you are using shutter slower than 1/60 second.” In fact, blurred pictures are the result of any one or more of three reasons – i) improper focus ii) camera shake by using slow shutter speeds iii) movement of the subject during exposure. If you want to get a sharp pictures of a moving train or of a pace bowler immediately before delivering his ball in a cricket match, you have to opt for exposure of a very short duration – say 1/2000 second or even less. But in case of buildings, you can open the shutter for several minutes if the camera is firmly supported by a tripod. If we want long exposures in a sun-lit scene during day time, we have to opt for minimum possible aperture (22 or 32 if possible), lowest possible ISO senstivity (100 ISO or less) of the film / sensor and an ND filter (Neutral Density Filter) which is a dark coloured sun-glass for your camera lens. ND filters come in varying strengths – darker glasses allowing longer duration exposures. Got it? Wide angle lens at 18 mm. offers excellent depth of field. After all, when so many sweets are on display, everything should come out sharp. Selecting large apertures helps in getting rid of distracting background. Throwing background out of focus draws attention to our main subject of interest. 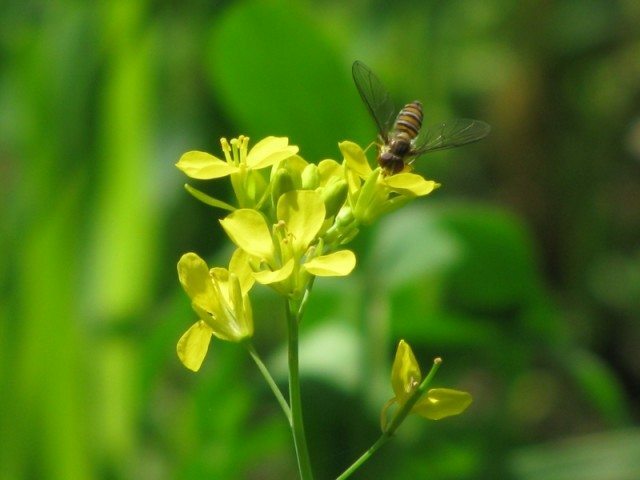 Here the vegetation behind these flowers has become a coloured background only. २) कैमरे की लेंस की ज़ूम कितनी फोकल लेंग्थ पर सैट की गई है? जितनी बड़ी फोकल लेंग्थ चयन की जायेगी, उतना ही कम एरिया शार्प फोकस में होगा। मान लीजिये, आपने 200 mm. फ़ोकल लैंग्थ पर कैमरा सैट किया है तो कैमरे से दस फिट दूर खड़ी आपकी पत्नी तो शार्प फोकस में आयेगी किन्तु 8 ft. या 12 फिट की दूरी पर मौजूद पेड़ – पौधे स्पष्ट नहीं दिखाई देंगे अर्थात्‍ फोकस में नहीं होंगे ! 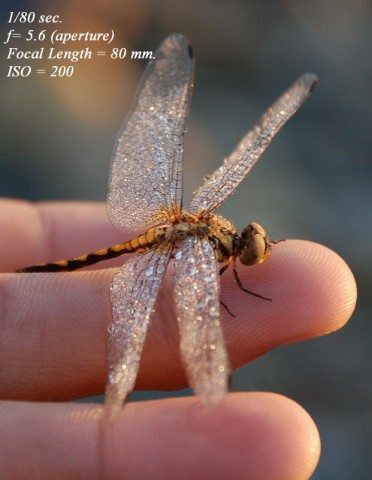 1) Larger the aperture, shallower would be the depth of field. 2) Longer the focal length, shallower would be the depth of field. 3) Nearer the subject, shallower would be the depth of field. Thus, if we want to focus on a single object and want everything else to remain unobtrusive and out of focus, we should choose highest possible tele setting on our camera, should open up the aperture as far as possible and should also move closer to our subject of interest as much as possible. These three factors would control the depth of field (area appearing to be in focus before and beyond the point of critical focus is known as depth of field). A tripod is a must to avoid any blur in this kind of photography. Not all lenses offer aperture values from 1.4 to 32 to us. We find that a particular lens starts at f=2.8 and ends at f=8 while other starts at 5.6 and ends at 22. Similarly, shutter speeds offered by a camera also differ from model to model and make to make. While a camera may start at 1/1000 sec. and end at 1 second, some other camera may start at 1/4000 or 1/8000 and may end up at 30 seconds at the other extreme. Modern digital cameras cope with unexpected colours of stage lights very well. Waiting for the Sunrise ! Having learnt the basics of the camera, we may now move on to understand the LIGHT. Photography literally means – recording of light. There are primarily two sources of light – natural and artificial. 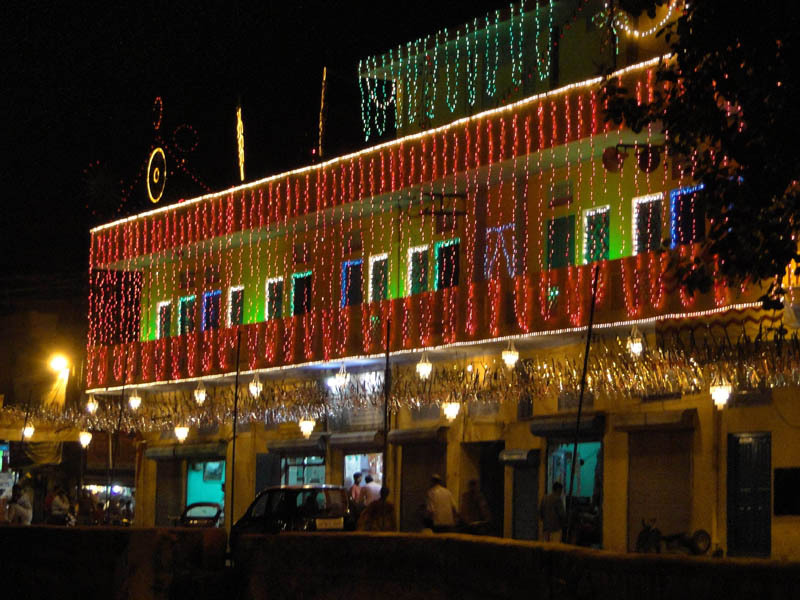 Sunlight, moon light and fire are natural sources of light whereas bulbs, halogen, mercury vapour, sodium vapour lamps, fluorescent tubes, CFL tubes, LED lights, flash light etc., fall under artificial sources of light. Each of these has its own characterstics. In order to understand the light, we need to understand its colour temperature (measured in degree kelvin), direction, intensity, size of source and angle. Quite interestingly, reflectors are also great source of light for a photographer. Sky is the biggest reflector of light known to us but water, sand, building walls, vegetation also serve as reflectors and we need to consider their effect on our photographs. We can continue to study about them in next post. ????????? ???? ????? ?? ?? ?????? ?? ??? ???? ???? ???? ???? ????????? ?? ?? ???? ? ?, ??? ?? ???? ???? ??? ?? ???? ????? ? ???? ?? ????? ???-??? ??? ?? ???? ???? ???? ??? ?? ???? ??? ????? ???? ??? ?????? ???? - ???? ?, ????? ?, ?????? ??????? ?? ???? ?????? ???? ???? ????? ??? ??? ??? ?? ?? ?? ! ???? ?? ???? ?? ?, ?? ????? ? ?, ???? ?? ????????? ?? ????? ?? ?? ?????? ???? ??? ????????? ?? ????? ???? ????? ???? ???? ????????? ???? ??? ???? ?????? ???????? ???? ?? ???? ??? ???? ??? ???? ?? ??? ??? ??????? ?, ????? ?, ???? ?, ?????? ?, ????? ?, ????? ?? ?, ??????? ?, ????? ?, ?????? ??? ?, ????? ?, ???? ?, ??????? ?, ????? ?, ??? ?, ??? ?, ??????? ?, ??????? ??? ?? ???????? ?? ???????? ????? ???? ???? ??????????? ??? ??? ???? ??? ???? ?? ?????????? ????? ??????? ???? ???? ?? ????? ??? ???? ??? ?? ????? ????????? ??????? ?? ????? ????? (Staff Training Centre and Marketing departments) ?? ?????? ?????? ?? ??????? ??? ???? - ???????? ???? 1958. ????? ??????? ???? ?? ?, ???? ????? ????????? ???????? ?? ?? ???? ??????????? ??? ? ?, ???? ??? MBBS ???? PG ?? ????? ?? ??? ??? What a wonderful way of sharing such valuable information. This post of yours will benefit all people like me who inherited or have a �good camera� but know nothing about the correct usage of it. I certainly will not remember all of the information that you have given but I defiantly will take a print out of this and will keep it in my camera bag. Thank you so very much. ??????? ?????? ? ?, ??? ?? ????? ???? ?? ?? ??? ? ??? ?? ???? ??????? ?????? ?? ??????? ???? ??? ?????? ? ?, ???? ???? ????? ??????? ?? ?? ?, ???? ?????????? ??? ???? ?????? ??????. ???????….. Tks sushantji.. since I have purchased a new camera which has both manual as well as automatic systems, I am experimenting with it and your post may help me a lot in understanding the abc of photography. No, this post was written by me between 20th Feb. and 21st Feb. only. I referred to film rolls since there may be some people who still use film cameras. Whatever speeds used to be available in roll films are now available in digital camera also with the added benefit that you can change the speed (ISO rating) for individual pictures also. I mean you can take one picture at 100 ISO and next with 400 ISO and still next at 3200 ISO. We could not have dreamt of such a facility in the days of film cameras. In those days, one had to decide the ISO speed at the time of buying and loading the film. All of us are extremely fortunate because we have such wonderful equipments which our forefathers could not have even dreamt of. Thank you for liking the effort. The subject is too vast and may need many more posts. If editorial board would permit me to continue, I can share whatever I have learnt in all these decades. Wow! I never knew that you are an expert photographer. I always only used auto focus cameras. Your’s this post is the beginning of the learning real photography. Thank you for the encouraging words. Auto cameras are good for day light photography of landscapes. Since your subject is located at infinity, everything comes out pretty sharp and well-defined. Otherwise also, modern digital cameras are wonderful machines which take away almost all worries off the photographer and take most of the decisions themselves. Still, if you know what your camera is doing and why, you start enjoying photography even more. Excellent post and a very good initiative. Very detailed & informative, supported by classy examples and I’m not exaggerating. Reg. 1st photo, I would love to carry my digicam with me always, you really never know when you find such a subject. Personally, it will really be useful for me, as some of time also spent these days in experimenting various features. Most of us are not pro, but one thing is common i.e. our love with photography. Everyone of us love to shoot, love to capture those sweet memories in our life, which will feel you happy, may bring tears as well when you look them after a long time. Thank you for coming to this post and going through it with all seriousness. The way I understand it, ‘learning a skill’ is actually transferring the responsibility of performing an action from Conscious to the Sub-Conscious. When our Sub-Conscious is performing an activity for us, we consider ourselves ‘skilled’. Reflexes are generated and we start doing things ‘effortlessly’. When I see women knitting while watching their favourite TV show or while gossiping, I am acutely aware of the capabilities of our Sub-Conscious to accept the responsibility of performing an activity. A child takes 6 months to be able to learn to say ‘MA’ or ‘PA’ but very soon, parents have to teach him ‘how to keep mum.” !!! Same is true in case of photography also. When we buy a camera and start using it regularly, it soon becomes an extension of our upper extremities and we are able to use it dextrously in various situations to get desired results. One doesn’t have to be a ‘pro’ to use a camera skillfully. I love the way you explained ‘Learning a skill’ is just too good and can’t resist myself from posting another one. If possible (I have to search my archives), I will share a graph with you, which explained various stages of photography in few curves and you may use it in your post, if you find it useful. It will take me few more readings before I fully understand focal lengths and apertures. needless to say Optics in Physics was not my favourite topic. Until then I will keep using my Auto mode. I hope you cover the sunlight wash effect in your next post. And how we can use WB option. Becuase this is one common problem I always encounter. Also, how we can get better results shooting into the sun. My camera has the Backlight Correction option. But if you could give examples, I can start using the Manual mode for such lighting situations. As always, the post is a delight to read and the photos ‘picture perfect’. I am still trying to figure out the tip given by DL! Thank you for going through the post and liking it. 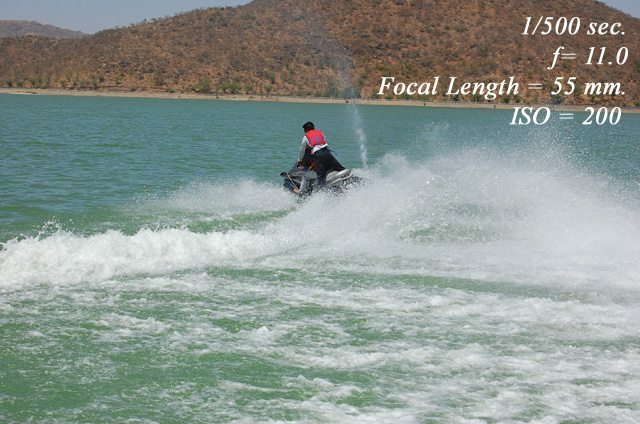 If your zoom lens is rated 18-55 then it has the focal length ranging from 18 to 55. At 18 setting, a lot of the scene is covered but everything comes out small. When we move the ring and reach at 55, the objects appear approx. 3 times larger but only 1/3rd of the area can be covered in the picture now. In older days, cameras were sold with a fixed focal length lens only. Zoom lenses were very costly and were markedly poor in their optical performance. But now, almost every camera is supplied with a zoom lens i.e. variable focal length. As regards DL’s tip, suppose we have 18-55 lens on our camera. When we are shooting at 18 mm. setting (completely zoomed out position), we can hope to get acceptably sharp pictures at 1/15 sec. shutter speed. The camera shake won’t be noticeable. But when we shoot at 55 setting (zoomed in), we need faster shutter speed – say, 1/60 or less to avoid camera shake. Since the image is 3 times enlarged at 55 mm. 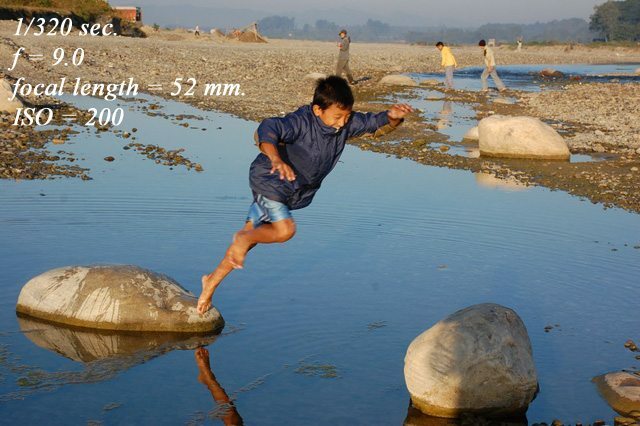 focal length, any camera shake caused by unsteady hand would also be 3 times enlarged. However, if we are using a tripod, we can choose any shutter speed without fear of any camera shake. Backlighted portraits are my favourite. But we must not allow the direct sunlight / other source of light to strike directly on our camera lens. We need an effective lens hood to protect our lens from unwanted light or we can ask someone to stand between camera and the source of light. Even a piece of card board can serve our purpose. The basic idea is – “our lens must not be able to see the light source.” Backlight correction option merely opens up the aperture to increase the exposure. When your wife is looking into the camera and has got Sun behind her, her face is in shade. You need to increase the exposure so that she would appear fair-complexioned ! 13 exclamation points! Trying to figure out their meaning ! LOL. Bahut badiya Sushant Sir, kaafi baatein bahut simple tareeke se bataya hein. Thank you, Upanshu. You have encouraged me to write more on the subject. By the way, your name sounds very good. What is the meaning of UPANSHU ? Thanks for liking my name. “Upanshu” is a japa or say mantra. Few people says that Upanshu means bright as sun. Interestingly, my mother says that I chose this name myself, they gave me name as “Ankush”, but when my Nursery school teacher asked my name to add in the school register, I mentioned “Upanshu”, don’t know where it came from to me. I don’t plan for photography trips except the air shows, I just take pictures whenever I visit somewhere. I am using Nikon D70 for past 9 years and use 18-70, 80-400 and 50 mm prime lens. 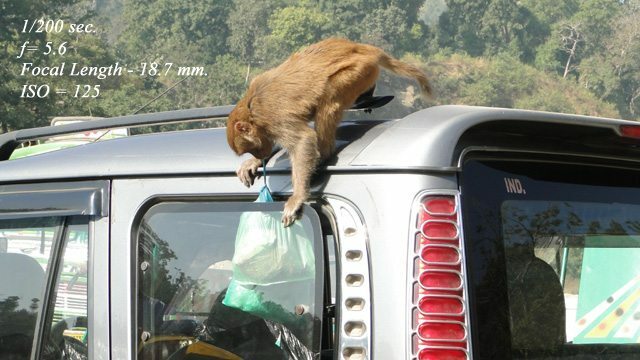 Kabhi mauka mila to Dehradun aakar milta hoon aapse aur kuch tips leta hoon photography per. Sushant Ji, you are not Guru but Mahaguru in this field. I did not have patience to read full blog but a look at the photographs was enough to establish your expertise, I confess. ???? ??????????? ?? ????????? ?? ???? ??? ?? ???? ?? ??? ??? ? ?, ?? ??????? ?? ???? ??? ?? ???? ?? ??? ?? ?? ??? ??? ??? ???? ? ??????? ??????? ! ???? ?????? ?????????? ?? ??? ???? ??? ??? ??? ?? ????? ?? ?? ?????? ?? ??? ??????? ?? ???? ???? Superb introduction to photography, Sushant. It is a must read for all ghumakkars since photography is an integral part of travel and all of us would like to capture the sights for rekindling pleasant memories at a later date. To compress that much information into just one post is an art in itself. To have completed this blog in just two days is an amazing feat in itself. The pictures selected by you for illustrating the text are not only very apt for this article but are also an excellent testimony to your command of this demanding craft. Your depth of knowledge and passion for photography is evident in the meticulous manner you have tried to explain highly technical stuff in a manner that it is easily understandable by even novices in this field. I also liked the anecdote in which you explained that photographic skills are acquired only after years of dedicated practice and that learning is a lifelong process. I am also flattered that you have used a tip given by me in your article. 1. I felt that the table might confuse beginners. For example, one might wrongly interpret it as stipulating that at an ISO setting of 25 and aperture of 32, the correct shutter speed is 1/1000th of a second. If anyone tried that, they might not get any image at all! 2. You could have introduced the term EV (exposure value) while explaining the relationship between aperture and shutter speed. 3. A simple but essential tip for ensuring sharper pictures while using POS (point-and-shoot) cameras where one cannot select apertures or shutter speeds: Always squeeze the trigger button slowly instead of pressing it. Pressing it will shake the camera and blur the picture. Squeezing it will minimise camera shake and result in sharper images. Looking forward eagerly to the next in this fascinating series. I hope that Nandan relaxes the only-on-22nd-of-each-month role for this series so that we do not have to wait too long for the next lesson. Please accept my heart-felt gratitude for the highly valuable observations provided by you. I have tried to correct the table and in order to take care of the Observation No. 2, I have also added some explanation after the table. I took so long and kept deferring writing on this topic and then when deadline approached, had to write it in a haste because I was not able to decide for whom I should write? If there are Ph.D., post graduates, 10+2 pass outs and primary level students – all of them sitting in the same class room, whom the teacher should address to? I know about your command over photographic medium, so can’t imagine telling you one or two things about the topic. But there are people who are happy with aim and shoot simplicity of their camera. To make things more difficult for me, Nandan wanted me to write it in pure ghumakkari style – the way you explained your peacock photo earlier. Still, I have enjoyed writing whatever I could and am willing to continue writing more and more. Thanks again. ?? ?? ????? ?? ?? ?, ??? ??? ?? ????? ?? ?????? ? ?, ???? ???? ??????? ! ???? ?? ??? ???? ??? ????? ?? ???? ????? ??? – ????? ???? ???? ?????? ?? ?? ?? aperture / focal length / shutter speed ???? ?????? ?? ?????? ?? ?????? ???? ?? ?? ????? ???? ??? ?? ???? ! ?? ??? ????? ?? ?????????? ?? ???? ????? ?? ???? ????? ???? ?? ?? ?????? ??? ??????? ?? ???? ?, ??? ???? ?? ????? ??? ??????? ?? ??????? ???? ?? ???? ???? ?? ?? ?????? ?? ? ?, ???? ?????? ?? ???? ?? ?? ?????? ?? ?? ???? ??? ???? ???? ?? ?????? ?? ??? ?? ?? ??? ?? ??? ?? ???? ?? ?????? ?? ??? ?????? ??????? ????? ?? ???? ! ?? ???? ??????? ?? ????? ????? ????? ?? DL ?? ??? ?? ???? ?????? ???? ????????? ????? ?????? ? Inspired by this post, today I bought Nikon D3000. However – this is a big animal and I walk without burden. Wow ! Hearty congratulations on acquiring a wonderful tool, Praveen Ji! I hope and wish this latest acquisition of yours will offer you limitless joy and satisfaction. If you have been using LCD screen of your earlier camera till now for focusing, you will need two-three days to adjust yourself to viewing your scene through the view finder but believe me, once you are comfortable with it, you would simply love it. Please start by taking some shots in P mode. 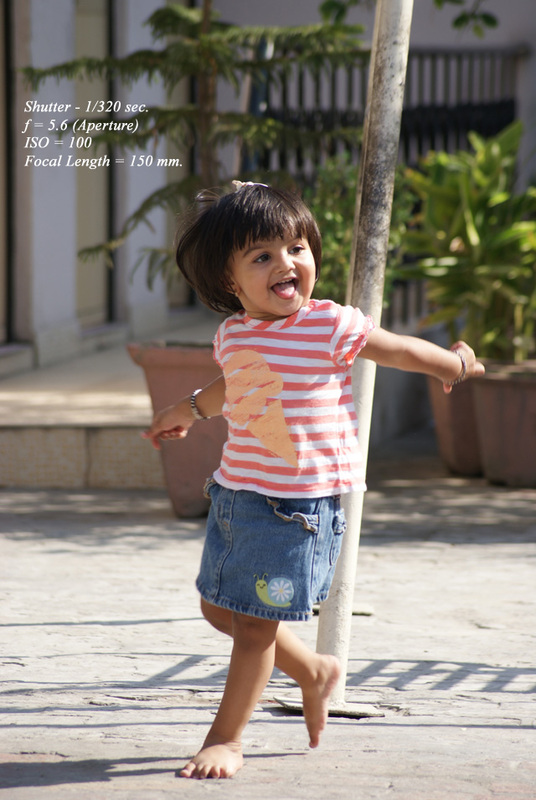 After 10-20 shots, try using A (Aperture Priority mode) in which you have the freedom to decide the aperture. The camera would try to set the corresponding shutter speed itself. Similarly, you can also try using S mode (Shutter-priority mode) in which you would decide the most preferred shutter speed and the camera would take care of suitable aperture. You may also try Portrait mode, Landscape mode etc. etc. By the way, which lens you opted for your camera? 18-55 / 18-105 or some other? I desperately hope it is 18-105. That would be simply great. Once again, best wishes and congratulations. Thanks Sushant Ji, It came with 18-55. Once I learn to use it, I may buy other lens too. I spent 3 hours tomorrow to learn its mechanisms and then got headache and gave it up. Good idea about using P mode but after 3 hours struggle I though I can only ever use auto mode but after your’s this reply I will take it out on the Raritan river near me to practice as weather opens up. Whole winter it was not cold but then suddenly it arrived in February. I got your email that you sent pictures taken by your son. Pictures are stunning. Photography runs in your blood I guess. Thank you sharing this brilliant post with us. It was quite difficult for me too to express yourself in two languages. I didn’t do exact translation because that becomes so mechanical for me. It wouldn’t have done any harm to you reading both the versions but yes, it does seem odd. ???? ??? ?? ?? ????? ?? ?????? ??? ?, ??????? ! ???? ????? S6300 ????? ???? ????? ?????? ??? ???? ???? ?? ??? ?? ?? Manual, Shutter Priority, Aperture Priority modes ????? ?????? ???? ????? ??? ????? ??? ??? ??? ??????? ?????? ?? ???? ????? – ????? ???????? ?? ?? ??? ????? ????? ?? ??????????? ?? ???? ???? Auto, Scene (Scene Auto Selector, Portrait, Landscape, Sports, Night Portrait, Party, Indoor, Beach, Snow, Sunset, Dusk, Dawn, Night Landscape, Close-up, Food, Museum, Fireworks Show, Black and White Copy, Backlighting, Easy Panorama, Pet Portrait, 3D Photography), Special Effects, Smart Portrait, Subject Tracking ??? ?? ?????? ???? ??? ???? ???? ?? ????? ???? ?? ??? ?? ??? ???? ?? ???? ?? ???? ??? ??? ????? ????-???? ???????? ??????? ?? ??? ? ?, ?? ?? ???? ????? ?? ?? ??? ?? ?? ??? ? ?, ?? ????? ????? ???? ??? ????? ??? thanks for your very informative post.I think this is helpful for hiny end users or SLR camera user only. Pls share some important tips for Digicam users like me..
All digital cameras are called digicams – whether point and shoot, DSLR or other high-end compact cameras. Digicam is the short form of digital camera whereas handycam is used for small video cameras. I will try to change the format of my photography articles in future so as to be more useful for everyone. Thank you for the suggestion . Thanks for your prompt reply and clearing the doubts.. So, I want some tips on point and shoot photography.. Very Informative post, hope in future you will write more on photography. Thank you Surinder Sharma Ji. I read this post twice, just to ensure that I earn to comment on it. An academic topic, rendered in a matter-of-fact style. Very readable, and very useful for everyone. My personal story is that I got tired of lugging the SLR few years back and then started doing P-n-S and finally (sorry, it almost sounds as blasphemy here) I am now happy shooting with my mobile phone. Though so far (till last visit from where I returned last saturday), I have been carrying a P-n-S camera with a lot of controls around S/A priority, Portrait, WB and all that. Recently I acquired a new phone and decided that I am planning to stop carrying the P-n-S as well. And on public demand, the 2nd chapter on ‘Lighting’ should happen soon, as your time permits. It really depends on what are your expectations from your photographs. If your requirements are not much, and the approach to photography is rather casual, a mobile phone can easily satisfy you and me. For example, from Saharanpur up to Indore hotel, I didn’t feel a need to take the camera out of my bag and kept shooting with my Sony Xperia mobile phone only. But when I was in the zoo/Rajwada /Central Museum etc., I had bigger demands which even my Sony HX-1 would not have satisfied easily. As soon as I press shutter button of my DSLR, a picture is recorded instantly even in low light / action scene. 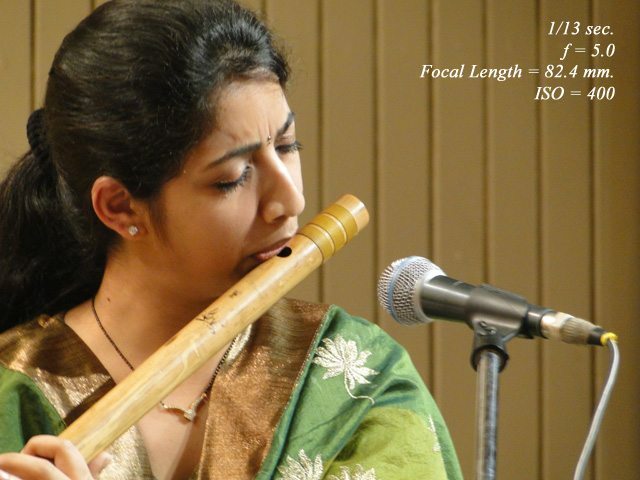 The picture given above of Ms. Debopriya – the flute player who had accompanied Pt. Hari Prasad Chaurasia, was taken with Sony Compact camera HX 1 quite easily because she was almost still when the shutter was pressed, but this same camera would irritate me a lot if I am trying to take photograph of Kathak dance performance because there would be a lot of delay between pressing the shutter and actual photograph recorded. The dancer may have turned around, have changed her posture or location on the stage, even the lighting might have changed in the meantime. I will never get what I want in such a situation. A DSLR becomes a MUST in this situation. So, every tool has its own importance and plus points. Strangers wouldn’t take your picture taking seriously if they see you taking pic with your mobile. But if you aim a real professional gear at them, they would feel intimidated and would question your motives also. In travel photography, Aim-and-shoot cameras win over others if it is a family tour. If you are happy with day-light snapshots, even mobile phones would serve well. Thank you for permitting me to go ahead with write up on LIGHTING. Lighting affects every photograph whether taken with DSLRs or mobile phones. So, it should be useful to every ghumakkar who is interested enough in this subject. this was one topic which was waiting to be narrated here. And who could have been better in this regard ? Photography is the second nature of any Ghumakkar – in ‘Ghumakkarshastra’ , Rahul Sankrityayan writes that Ghumakkar may be accompanied with a camera (ch-5, swaavalamban). It is a most grand and humble notion, considering that the book was published in 1948 !! Came to this page after an interval of several days. Sorry for delay in acknowledging your lovely comment. Since you are mentioning 1948 as the year of publication, it has to be the reference to a real book on ghumakkarshastra and not just a light hearted joke! I think I have never read a book written by RS – only small articles here and there written by him / about him. It is an excellent article on photography. And must for Ghummakkari. I am now planning to own D3200 Nikkon today or tomorrow. I am a novice but want to have only DSLR camera. So, did you buy your D3200 Nikon? If yes, hope it is giving you a lot of happiness. If you consider yourself a novice, please start with fully auto mode and slowly, experiment with various controls. You would love the results. I am following this ghumakkad post since quite a long time and very rarely i had the opportunity to see some really good photographs.now after your this quite educative photography special i hope to see better photos,which is a very essential requirement of a good travelogue.Hope it will help to improve the quality of photographs in the coming posts. Thank you for a nice primer on photography. Ultimately, as you say, practice makes perfect. I enjoyed reading the comments as well as the main article. Your example photos are too good! Sorry for missing some comments including yours which arrived comparatively late. Hope you didn’t mind much. I had enjoyed your Mecca trip with lots of ups and downs but it seems you don’t find much time to travel / write about them. Yes, it is true that the job does not allow me to travel as much as I would like to. However, I did visit the capital of Saudi Arabia, viz. Riyadh recently. The first part of this trip has kust got published on Ghumakkar. Do check it out. We hired a car to drop us to the ‘MANA VILLAGE’, 3 kms from badrinath then it was a walking distance of 1km to reach for ‘Vyas gufa’ where it is believed that ‘Vyas ji’ wrote ‘Mahabharata’. Walking more, made us reach a hill in the shape of a book, VYAS POTHI where ved vyas ji worked on the 17 ‘adhyaya’ and finding himself not so satisfied, created the 18th one there walking more, took us to the ‘Bheempul’ where Bheem kept a large stone on the ‘Saraswati nadi’ to help Draupadi cross the river. Saraswati river is really scary the sound of the flowing water was a roar with the help of some snacks, chilled water, our stomachs were not starving.